Are you one of the thousands of BLM boondocking RVers flying south to Arizona this winter? 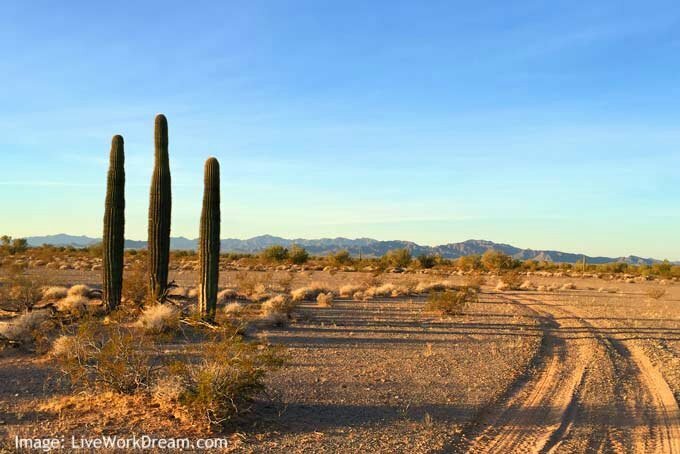 If so you’ll love having one less thing to do before setting up camp in Yuma or Quartzsite. The Bureau of Land Management (BLM) short and long term visitation area (LTVA) permit system is now digital at YourPassNow.com. Arizona BLM boondocking just got easier. Whether you’re joining snowbird crowds and headed to a Quartzsite RV rally, boating on the Colorado River or making family road trip plans to the Grand Canyon, now you can buy your recreation permit before ever leaving home. Between September 15 and April 15, BLM permits are required in many camping areas. For example, any camper who enjoys cheap or free BLM boondocking in popular BLM Long Term Visitor Area dispersed camping destinations like Quartzsite, Lake Havasu and Yuma must have visible BLM parking decals on their rig. Boaters cruising along the 155 miles of lower Colorado River managed by the agency must also have permits. Remember when you had to arrive at a BLM LTVA during business hours to get a permit before setting up camp? The new YourPassNow.com website gives you the ability to secure a permit online before ever leaving home. The LTVA permits are special recreation area permits authorizing permit holders to use the LTVAs. These areas that designated as highly impacted “special areas” by the BLM. The new permit system website makes life easier for the tens of thousands of BLM boondocking enthusiasts who enjoy low cost winter camping in Arizona. Buyers must keep in mind that no discounts apply to the LTVA long term or short-visit permit fee. Unused or unwanted permits are non-refundable. The system is the result of a partnership between the BLM Yuma Field Office and NIC Inc., a digital government services provider. YourPassNow is the latest big news from the BLM. It’s the easiest and fastest way for road trippers to purchase advance permits. The service is good for many other popular camping destinations like Sequoia and King’s Canyon National Park, Everglades National Park and Colorado National Monument. How will that work with my Access Pass? Does the Lifetime Senior Pass cover the the permits? SO can Canadian RVers and snowbirds get the BLM and LTVA passes? How does being over 65 impact us?